Our month in Biloxi, Mississippi was spent mainly with family. Christmas was wonderful, full of good food and some of our grandchildren. In addition, we hit a few museums and area attractions with them. We patronized various local eateries sampling the Gulf Coast seafood. We visited Bass Pro in Mobile. 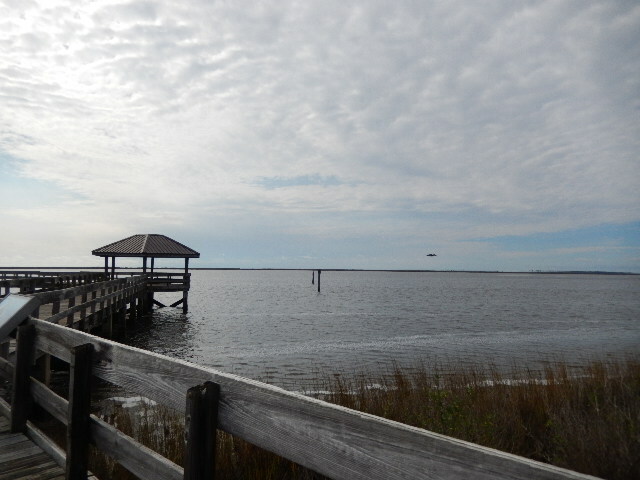 Walked the trails in the Gulf Coast National Sea Shore, the Sand Hill Crane Nature Preserve and toured the Navy base. We parked at Martin’s Lake RV Resort in Ocean Springs, Mississippi taking advantage of a monthly rate. We did not get to enjoy any amenities due to the rainy and colder than normal weather. It has a lot of residential rigs on-site but most were friendly. We visited with several Full-Time RV Travelers like us while here. Most of them stayed only a few days while heading toward another destination for the winter. This place suited our purpose this time, but we found a couple of National lands nearby with beautiful scenery that accepts our Senior Pass for a large discount. We prefer the more natural setting of a National Park. They were all full on this trip but do accept reservations, so we will try to arrange our time here to stay at a couple of those sites in the future. There is a 14 day limit at each park so we would have to move once for a month-long stay. 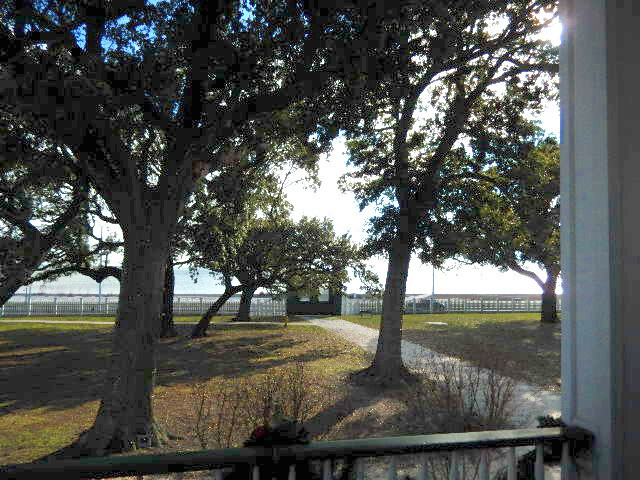 My oldest grand-daughter and I spent an afternoon touring the home, the grounds and the Presidential Library at the Jefferson Davis Home called Beauvoir, meaning beautiful view. It faces the Mississippi Sound. Jefferson Davis was the only Confederate President. He was the Secretary of War under Franklin Pierce, and served as a Senator during Abraham Lincoln’s administration but resigned when his home state seceded from the Union. He did not build this home, nor was it his Presidential Center. He came to Beauvoir to write his memoirs later in life in one of the guest cottages on site. He arranged to purchase the estate (as a summer home) and actually made one payment, when the owner, Sarah Ellis Dorsey (a classmate of his wife, Varina) died leaving it to him in her will. He with the help of Varina, completed and published a two volume memoir set titled “Rise and Fall of the Confederate Government”. Varina sold the house in 1903 to the Mississippi Division, United Sons of Confederate Veterans. The conditions of the sale were that it be maintained as a tribute to Jefferson Davis and the Confederacy and required it be used as home for Confederate Soldiers, their wives , widows, servants and orphans. About 1800 individuals called the site home until 1952. Many are buried in the cemetery on the grounds. Hurricane Katrina dealt damage to the grounds, facilities and furnishings, but the old house stood ground. Much was credited to the hard oak floors that had been tongue oiled over many years. The first floor is 24 feet above ground (to improve air circulation for the hot and humid summers) and the water rose to 25 feet, only a foot of water stood in the house for any length of time. The home and furnishings have been restored. The Presidential Library is a Civil War Museum and Genealogy Research Center. The grounds are being restored to the Jefferson Davis time including the Rose Garden, the fruit trees and the introduction of animals to the grounds. It includes a camel. Jefferson Davis, as Secretary of War introduced 33 camels for use by the US Army in the Southwest Desert. 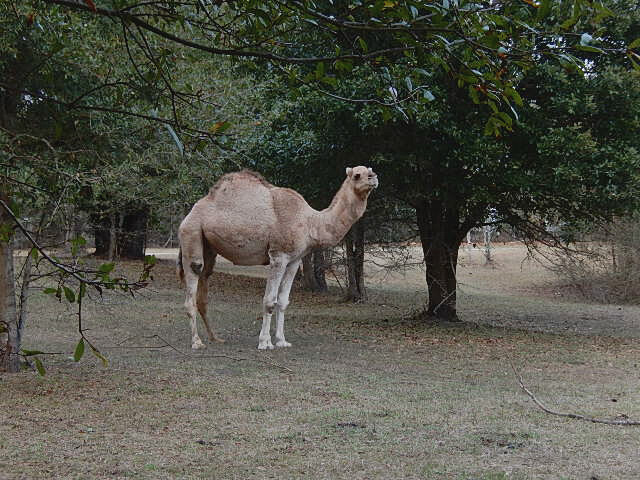 The camel lost favor once the railroad made its’ way southwest. I found this a most interesting historical site. I especially liked walking the cemetery reading headstones and admiring the young animals roaming the grounds. I did have an unsettling encounter with a blue baby bull, if he were a horse he would have been a yearling. He was practicing his head butting and I appeared to him as a good target. Fortunately, my grand-daughter came to the rescue, distracting him so that I could slip away.